Traditionally, it is said that most probably this city started patronising St Lawrence sometime between 1283 and 1410, during the rule of the Aragons, where the Saint was born. This was presumably brought about both by Aragon and local sailors, whose ships would sail to and from the Iberian Peninsula. Devotion to this Saint became so strong that during the subsequent year’s one of the churches in this city was dedicated to this Saint, and later the parish was started around it. On the arrival of the Order of St John, who had a large number of prominent Spanish members, the feast in his honour in the church dedicated to him in Vittoriosa were held solemnly. These were celebrated by the Great Prior of the Order with three masses, a vigil and an octave. On the day of the feast a solemn procession used to take place with the participation of many knights, and sometimes the Grand Masters themselves. Two of the most prominent who did this were Hompesch and Perellos, who decided to take possession of this city on this day. An indication of how this feast was celebrated after it was handed back to the Vittoriosa Parish Priest was discovered in an ancient document from 1662. In this document one can see various payments, for street lighting, fireworks, and damask church decorations which were rented from the Brotherhood of St Omobono in Valletta. During the years, not only the church decorations were not rented from other churches any more, but new ones were purchased and started being rented out to other churches. Apart from this, when the people were asked to contribute, although this implied huge sacrifices, they always did what they could. Proof of this are the large number of works of art that still adorn the church to this day, amongst which one can see the pulpit, organ gallery, cradle, pedestal and dalmatic for the statue. One cannot forget the building of the current church, and the various alterations, additions and decorations that were added later. During the years, the citizens of Vittoriosa made the feast such an event, that by the mid nineteenth century, the octave was celebrated almost at the same level as the day of the feast itself. There used to be general illumination and fireworks, generally purchased from Sicily. With these musical programs performed by various bands were added. There was a time when the Feast of St Lawrence was celebrated at the same level as that of ‘Imnarja’, to such a point that grooms used to promise their wives to be that they would take them to this feast after the wedding. It was a big feast on the sea, with a large number of boats filling the Vittoriosa, Senglea and Kalkara inlets. There were some years where apart from Vittoriosa, fireworks would also be set off from Kalkara. Instead of the Imnarja horse races, there would be boat races, and fans would be awarded to the winners. In old newspapers, this feast was given a certain prominence, showing how popular it was at the time. This could have been the result of how highly organised these celebrations were. An organisational committee of 5 members used to be elected, under the leadership of the archpriest, as early as the mid nineteenth century. 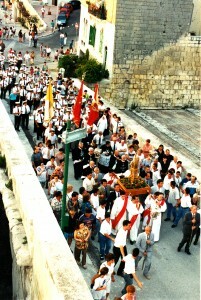 During the years, this procession became one of the most beautiful on the islands. As was typical of these processions in old times, this was a solemn and devout event. The various brotherhoods participating used to wear robes of various different shapes and colours. Closer to the present day, in the years before WWII, this procession used to start at 6.00 pm and end at 8.00 pm. During these two hours it used to go through the Main Square, then to Main Gate Street, continuing on Triq Santa Skolastika towards Sur Tal-Miratur, following to Piazzetta to Triq San Lawrenz and back to the church. Before the Admiralty erected the colonnade in front of the palaces which was removed some years ago, the procession used to pass from the waterfront from the times of the Order of St John. When it reached this location, the relic of St Lawrence used to receive a salute by the canons from the ships anchored in port, a tradition that after the order left the island was continued by the canons at Fort St Angelo up till the beginning of the twentieth century. 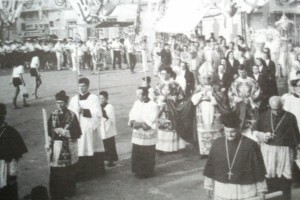 On the front of the procession, the Brotherhood of the Via Sagra walked after its standard, followed by the Brotherhoods of the Crucifix, St Catherine, St Joseph, Charity, Immaculate Conception and finally by the Brotherhood of the Holy Sacrament. After the brotherhoods, the Capuchin Friars used to walk from the convent of Santa Liberata, along with their tertiaries, wearing the Capuchin cassock. These were followed by the Dominican Friars of the Vittoriosa community. The altar boys of the parish church used to walk behind the Clergy Cross, followed by the priests. Ending the procession, in front of the Statue of St Lawrence, there was the archpriest, or any dignitary that was invited to the procession, with the relic between two priests. After the end of the nineteenth century, the music on the outside was as beautiful at the one in the church itself. Various musical Programmes used to be performed by the first band established in Vittoriosa, La Vittoriosa, or as its better know ‘Ta’ L-Iljun’, directed by band directors Phillip Galea and Paolino Vassallo. 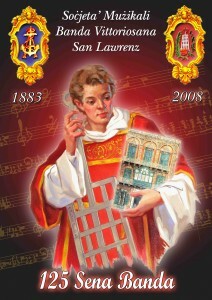 This band remains remembered to this day for its performance on the eve of the feast of 1877, the band with a children’s choir inaugurated the hymn to St Lawrence, written by Giovanni Pace and composed by the Sicilian Mro. Giuseppe Privitera. This was highly acclaimed, so much so that it was performed by the Gozitan Band La Stella, in the 1922 feast of St Lawrence in Gozo. Later on, due to the lack of a local band, various band of the moment used to participate, such as the La Vallette, Cospicua’s San Giorgio, Sliema’s I Cavalieri di Malta and sometimes Senglea’s La Vincitrice. Many of these kept their engagements even after the reorganisation period of the band of this Society. Later on, other band participated, including Prince of Wales, later the King’s Own of Valletta, Luqa’s L’Unione and both Zabbar bands, San Michele and Maria delle Grazie. Along with the local bands, there were the bands of the garrisons stationed on the Islands, who were regulars at this feast. Among these we find the R.M.A., mostly under the leadership of Mro. Bartoli. Another Maltese band was the Reale Milizia Maltese, lead by Mro. Doneo, shined in its interpretations of popular pieces of the time. Among British bands some of the best cont the likes of the Shropshire Regt., the Royal Irish Rifles, The Duke of Connaught Regt., the Queen’s Own Regt, the King’s Own Royal Lancaster Regt., the Dorset Regt. and the Worcester’s. One can take hints of where the bands used to perform from the reports in local media of the time. In the main square, both on the eve of the feast, and on its day, there used to be three. One of these used to be at 4.30 pm and two later. On the day of the feast there used to be one next to the police station, which was in South Street on the corner with Triq tal-Lunzjata, another one in Triq il-Kurdari, another one near the Church of the Annunciation, a band and the St Lawrence Wharf, and another one before the hill to the Main Square, nowadays Triq Nestu Laiviera, and another one on the Miratur Bastion. One of the most important feasts in the history of the band was the one in 1897, when it was named the Duke of Edinburgh. On the eve of the feast the band was accompanied by a children’s choir, performed for the first time A San Lorenzo, more popularly known as Frendo’s. The piece, written by Giovanni Pace and composed by a prominent musician from the band, Giuseppe Frendo, who was later, appointed assistant band director. The people around the bandstand liked this piece so much that to popular acclaim, it had to be performed twice. 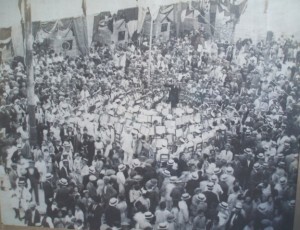 The same happened during the feast in 1907, when Mro. Giumarra debuted with the Duke of Edinburgh, with his own version of A San Lorenzo, again with lyrics from Pace. With the Band, Tenor Bacci and Baritone Duce from the Royal Theatre, and a choir of local youths performed flawlessly. After Mro. Artz took the reins of the band, a new chapter started for the band. During his times, traditional marches were slowly shelved, while he started introducing new foreign ones rarely heard before. This is confirmed by the programme the band performed for the Te Deum in 1926. These included R. Sperker’s Koseku March, Cerdan’s Marcia Andaluza Belmonte, Max Gabrile’s military march United Flags and Van A Scherzer’s Bayrischer Avancienmarch. Apart for the aforementioned feasts where two different Grandmasters took possession of the city, there were other feasts where unusual event occurred or during which new traditions, decorations or devotions started, which later became part and parcel of the feast. In some other a new piece was inaugurated in the church or something new and unusual on the outside. It’s impossible to mention them all, but it’s interesting to look at a number of these events, part of a feast that is more or less still celebrated along the same lines nowadays. 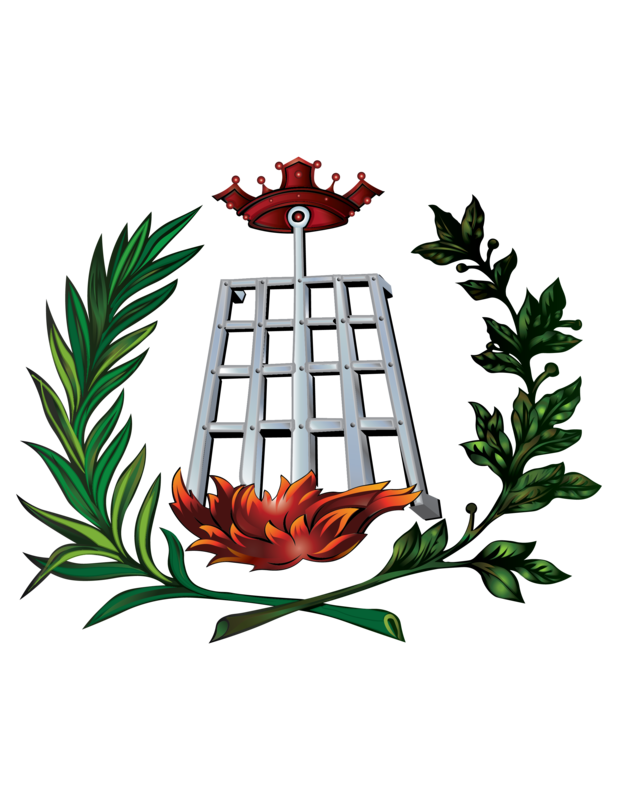 In 1885 was characterized by the addition of a new Brotherhood. The Brotherhood of the Via Sagra participated for the first in the procession. For the occasion, Bishop Buhagiar participated from his throne, where he called each brother as they came out and blessed them individually. There are only a few years where the external festivities were not done or else the Church celebrated less solemnly than previous years. Among these, there is the feast of 1887, when a few days before the feast, there was a cholera outbreak. The external feast was not held and the money collected was used to buy bread for the poor. The procession was held but with a penitential perspective, whilst the Rosary was said. Following a promise made on that day, the procession of Saint Lawrence was accompanied for some time also with this statute of Saint Rocco. The people were encouraged to apart from praying to Saint Rocco, they also pray to Saint Lawrence and a recommendation was written in the media that on the day of the feast, fire was to be made on roofs with wood and other material. The aim was to eliminate the virus with the help of Saint Lawrence! Another important feast was that celebrated in 1889. During that year, following the reorganisation years, the band L’Unione took part for the first time and further innovative ideas were implemented that year. In fact, the opening march of the feast was organised for the same time that year, together with the morning march known as Te Deum. These were mentioned for the first time in the reports of the feast of that year thus it can be concluded that these were done for the first time. This also proves the progress which the band made following the reorganisation and also how it was tied from early stages with the feast of Saint Lawrence. Another important development happened during the feast of 1890, when Vittoriosa was celebrating the 8th Centenary Anniversary of being a parish. During that year, for the first time, the band march accompanied a statue till its placement on a pedestal. The first statue to be carried this way was that of Pope Urbanu, which is still put up till today near the church. The pedestal was situated in Desain Street, just in front of Vittoriosa Stars club. 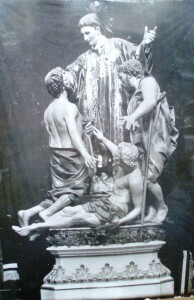 This statue was used for 6 years until 1896, when today’s Statue of Saint Lawrence was done. Although this statue was being put up on the pedestal in the morning march, in 1905 the location changed to Main Gate Street. This happened for a further 5 years, since in 2011 the statue was being carried and put on the pedestal on the 8th of August march, as it is done till today. This means that most probably, the Te Deum March was being inaugurated from this year with an exclusive thing to this feast, the traditional ball with birds. In 1922 the Vittoriosa Parish began celebrating the ten Wednesdays which lead to the celebration of the both internal and external feasts. However, it must be said that the devotion and celebration of these Wednesdays was given by Pope Alexander II in 1702. 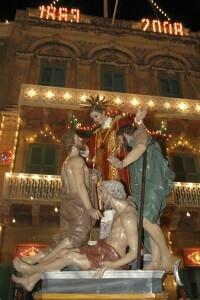 But one can say that finally, this tradition entered Birgu as well and is still being celebrated today. The first Wednesday, which happened to be 24 May, was celebrated by a mass at 6,00am and in the evening, after a rosary, Rev. John Mary Farrugia spoke about Saint Lawrence and explained the objective of such celebration. The church function ended with the singing of the hymn and antiphon accompanied by a proper orchestra. External celebrations began on Tuesday, where the Duke of Edinburgh and San Giorgio of Bormla performed a band march on Venetian style, which was followed by two musical programmes in the main square. The Cospicuan Band, under Mro Hare, performed musical pieces from operas such as Vespri Siciliani, Poliuti, and La Boheme. The Vittoriosa Band, under Mro Giumarra, performed selections from Nabucco, La Boheme, La Pace and Aida. The Following day, the Duke of Edinburgh band performed another musical concert based on saxes, which was the new initiative being taken by the band. main square under the baton of Mro Giardini Vella. This band was renowned for its interpretation of Amico Fritz, and which was applauded by all the people which had gathered around it. When in June 1940 Malta was attacked for the first time, an exodus from Birgu to more central places began. It is most probable that people did not have the time to organise the feasts and thus the external feasts were cancelled. But the internal feasts were organised nevertheless. 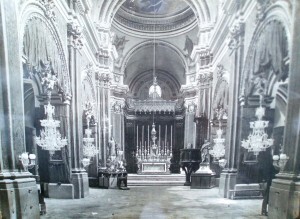 In 1940, the orchestra and vocalists could not take part, but the men’s museum wing substituted this with its choir under the direction of John Schembri and with Manuel Attard on the organ. This choir performed all the singing involved on the day of the feast. In 1941, there were two feasts of Saint Lawrence celebrated internally. One was help in the Chapel of Couvre Porte in Vittoriosa by Rev Paul Galea and for this feast, a small statute of Saint Lawrence the one which today is still being pt at the end of Saint Philip Street, was put for admirers. 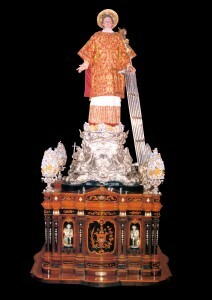 The other feast was celebrated in the church of Saint Peter, under the Nuns of Saint Benedict in Mdina, where the actual processional statue of Saint Lawrence was being held. In Mdina, even the internal feasts on the eve and the Solemn Mass on 10th August were held, with the participation of the nuns’ choir and Rev Raphael Mazzelli, Rev Lawrence Micallef and Rev Joseph Farrugia which were evacuated to Rabat. The speech on Saint Lawrence was held in the afternoon by Fr Pio Agius who was from Vittoriosa. 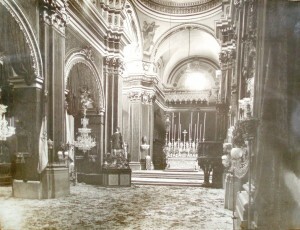 In 1942, the priests of Vittoriosa celebrated the feast of Saint Lawrence in the Church of Saint Paul in Rabat. For this occasion, the statue of Saint Lawrence was put up on a pedestal nearby the main altar. Once again, the mens’ Museum Choir was in charge of the proceedings. A year later, when the attacks reduced, the feast was once again celebrated, but in Vittoriosa. The Archpriest Paul Galea was in charge of the procession which took place with yet another statue of Saint Lawrence, still put up today at the end of Nestru Laiviera Street. It passed from streets were mainly all homes were in a bunch of rubble. Music and choir was under the direction of Mro Lorenzo Galea and participants were largely from the men MUSEUM. But one can say that special feast was that celebrated in 1944, the year when the statue of Saint Lawrence was brought back to Vittoriosa. The feast was started on 30th July when a procession took place form Cospicua till Vittoriosa. When the statue was entering the church, the big crowd which gathered applauded and chanted to Saint Lawrence, and such emotional cheer is being held till today. Of course, one could not expect that the church functions were not held as solemn as ever. Archbishop Gonzi took part on both 9th and 10th August. The external festivities, although the streets were not decorated as usual, were animated by not less than 5 bands. These were the Duke of Edinburgh, Beland of Zejtun, Saint George of Cospicua, Unione of Luqa and Saint Michael of Zabbar. In the following years, the feat continued to grow. Every year, new decorations were being put up and the participation of the Duke of Edinburgh band was constant and centre to the external celebrations. Among these one can mention the participation of the band’s central committee in the feats of 1972, when it was decided to change the route of the procession, thus the procession will go down Main Gate Street instead of up. However, the Police were opposing the idea, and this happened only through a concession granted in the last hours, following a personal guarantee entered by Mr Lawrence V. Farrugia, the club’s Secretary and member of the special committee. 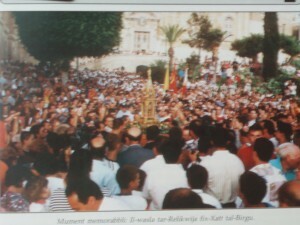 I n 1990, Vittoriosa celebrated the 900th year anniversary of the church being proclaimed as a Parish. Among the activities organised, spread throughout a whole year, the Feast of Saint Lawrence was a pure gem. Both internal and external celebrations were organised different from previous years. The feast was opened internally on the occasion of the first Wednesday and in ever Wednesday, representatives from Religious Orders took part. All functions were terminated by the Centenary Hymn composed by Mons Lawrence Mifsud on lyrics of Rev France Camilleri. The celebrations of the feast initiated with a musical programmed organised by the Saint Lawrence Band Club on 30th July. On that day, the presentation of the Centenary flag was done and this was to be used on every day. From the following day till the day of the feast, internally priests from other parishes were invited to take part. These were from Senglea, Cospicua, Saint Paul of Rabat and Valletta, Kalkara and Dominican friars of Vittoriosa. In the external feasts, one can mention the innovative idea of accompanying the statue on 8th August. In fact, the Saint Lawrence Band Club joined the statue on a small ship in Vittoriosa Wharf and once on land, the march started till the putting of the statue on the pedestal. The following day, after the morning march, the Saint Lawrence band participated with sacred hymns in the procession which was held before the function of the eve of the feast which was celebrated by Mons Nikol Cauchi, Bishop of Gozo. The mass of the feats was celebrated by Mons Joseph Mercieca, Archbishop of Malta. These centenary feasts were closed by a band march made by the Saint Lawrence Band Club on 30th December, to the satisfaction of all committee members in the special committee, Archpriest Paul Raggio and the people of Vittoriosa. The musical part, or better presence, was found all year round. Apart from the normal band services of the Saint Lawrence Band Club during the feast, in March a concert on organ was held by Mro Joe Caruana in the Parish Church. 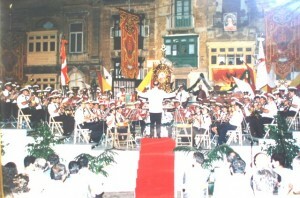 The Prince of Wales Own Band, of Vittoriosa also took part with band marches and a musical concert on the occasion of the feast of Saint Joseph celebrated on 5th May. The Manoel Orchestra, directed by Mro Joseph Vella, performed the Oratorio 900 years as Parish in the Church, with lyrics of Profs Oliver Friggieri and composition of Mro Prof. Joe Vella. This Oratorio was held under the patronage of H.E Dr Vincent Tabone, President of Malta. During the day of the feast, a lot of other bands took part. 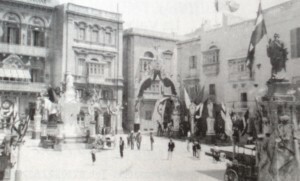 In fact, together with the Saint Lawrence Band Club, the Saint Joseph Band Club and Sagra Famiglia of Kalkara, King’s Own and La Valette of Valletta, Count Roger of Rabat, Saint George of Cospicua, Queen’s Own of Senglea, Queen Victoria of Zurrieq, De Paula of Paola, Saint Michael and Maria Mater Gratia of Zabbar, Saint Andrew and Unione of Luqa, Anici of Qormi and Saint Philip of Zebbug took part. The feast of Saint Lawrence celebrated in 1997 will be remembered for a number years, since something which was deemed impossible to happen, happened. This was the arrival of the Relic of Saint Lawrence head, which for hundreds of years, it was kept in the private chapel of the Pope in the Vatican. This arrival coincided with the celebration of the three hundredth anniversary from the building of the church. 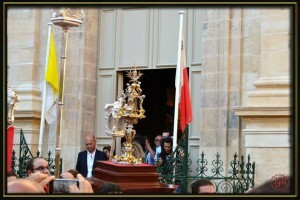 The relic arrived in Malta on Tuesday 28th July and from the airport, it was taken to the Parish Church of Paola. Following some prayers, the relic was on its way to Valletta where it was met from the priests of Vittoriosa and Saint Paul of Valletta, together with those of Saint Lawrence in Gozo and other religious communities of Valletta. A corteo was formed, with the presence of the Saint Lawrence band, which accompanied the relic till Saint John Co-Cathedral. Here, the General Vicar, Mons Carmelo Xuereb and other dignitaries such as H.E Dr Ugo Mifsud Bonnici, President of Malta, celebrated a solemn mass, animated by the Choir of Saint Julian under the baton of Rev John Galea. The speech on Saint Lawrence was done by Mons Lawrence Mifsud. The following day, the relic was taken to Gozo, in the village of Saint Lawrence, where it was held in the local parish church for 7 days. The relic was brought to Vittoriosa on Monday 4th August, where a journey on sea was organised. It arrived at about 6.00pm, where a large crowd was waiting. This activity was given promotion by local TV and Radio Stations through live feeds. 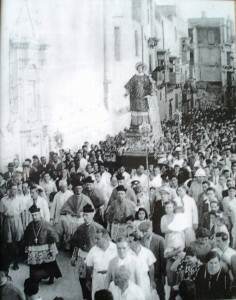 The relic was taken in a procession from the harbour to the Church, Saint Lawrence Street, entrance of Vittoriosa, Main Gate Street and main square. In the square and on the band stand which was put up for the first time, the archpriest Daniel Farrugia celebrated a mass animated by the choir of Saint Julian’s. After the mass, the relic was taken to the church. On the 9th and 10th of August, the peak of the feast was celebrated. Once again, the small procession of the eve of the feats was accompanied with Scared Hymns played by the La Valette Band. The mass of the feast was celebrated by the Dutch Cardinal Adrianus Johannes Simonis and was assisted by the Archbishop of Malta and with The Vatican representative Sebastiano Labaoa. 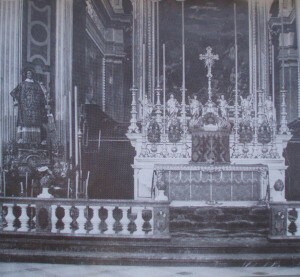 The procession was quite unique, since apart from the statue of Saint Lawrence, there was also his relic. During the week band marches and musical programmes were done by Stella Maris of Sliema, La Valette and King’s Own of Valletta, Count Roger of Rabat, Anici of Qormi, De Paule of Paola and Sliema band, apart from the Saint Lawrence band. However, two years following this feast, the feast of Saint Lawrence experienced some troubles. The External Festivities committees, formulated in 1999, wanted to add another band for the 8th August march, which however was rejected by the priests of Vittoriosa. Even the Curia was not in favour of this proposition, given that new instructions were published some time before. 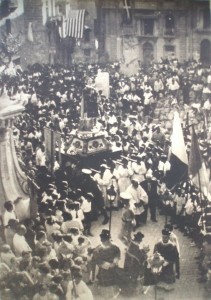 Following a number of meetings with the aim of reconciliation with the Curia and with the Archpriest, the external festivities committee stuck to its position and a month before the feast gave its resignation, but administered the feast through that year, as was written in the press release “so as the people of Vittoriosa will not be refused the feast to which it has an obligation”. After the fest, many though that the feast of Saint Lawrence will pass through difficult times, especially given that another Society and Band was formed by ex-members of the festivities committee. However this did not happen, since the new band club was quite cautious and secondly Archpriest Bonanno found the support of many individuals and work of the previous external festivities committee continued. The Youth section was put up once again in 2000 with the objective of providing help to the new external festivities committee and the Saint Lawrence Band Club, the two main organisations involved in the feast. Bit by bit, the situation was getting to normal and the feast was being celebrated as it was before, especially from 2003 onwards when an agreement was reached between all parts and thus everyone was together again. This led to higher expectations from all those enthusiasts that wanted to see a strong Feast of Saint Lawrence once more. The feast celebrated in 2008 was once again a special feast, where the 1750 anniversary from the death of the Saint Lawrence were commemorated. The celebrations initiated on the eve of the feast of 2007, when the church proceedings were done by Archbishop Emeritus Joe Mercieca. After the church celebration. 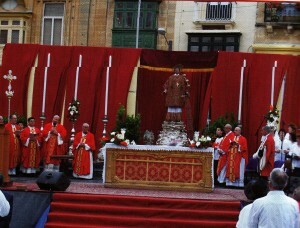 Archpriest Joe Caruana informed the crowd that the Vatican accepted the request made by the Church of Vittoriosa to have the relic of Saint Lawrence once again in Birgu in 2008. Mons Mario Grech, the bishop of Gozo, lit up the Centenary Candle, presented by Mr Lawrence V. Farrugia, secretary of the special committee, so as to remain lit up during the year 2008. On Thursday 10th April, in the church, under the patronage of President Emeritus Dr Ugo Mifsud Bonnici and with the participation of a number of speakers, among those Profs Guglielmo de’ Giovanni-Centelles, Accademico Pontificio di Belle Arti e Lettere an event was organised. Two days later, in Castello Saint Angelo, under the Patronage of Fra John Creitien, a symposium was organised with the subject being Saint Lawrence in Archaeo logy, Arts and History. The speakers were Prof. de’ Giovanni Centelles, Fr. Gino Gauci, Lic Art., Prof. Stanley Fiorini, B.Phil, MA (oxon), Ph D. and Mons.Dun Ġwann Azzopardi, Lic D, Prel SS. The celebration of the first Wednesday of Saint Lawrence will be remembered for years to come. The Saint Lawrence Band Club performed a band march on Tuesday, also on the occasion of its 125th Anniversary from the foundation and accompanied the statue of Saint Lawrence which is used in the band march from restoration. The following day, on Wednesday, a solemn mass was held in the square and the processional statue of Saint Lawrence was accompanied by the band through the main streets of Vittoriosa through the playing of hymns. Unfortunately, the relic which was supposed to be in Malta for the feast was not sent by the Vatican. The reason for this unfortunate mishap was that the relic is in a precarious state and thus can’t be transported to anywhere, let alone to Malta. 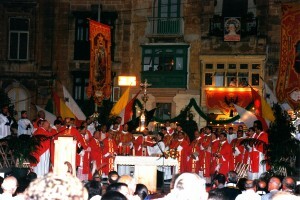 However, even through the big festivities done by the Saint Lawrence Band Club to mark its anniversary, the year 2008 will be remembered for the special feast held in Vittoriosa in recent years. On Wednesday 28th May 2014, which was once again the first Wednesday of Saint Lawrence, the processional statue of Saint Lawrence was once again welcomed in Vittoriosa following the restoration done. This restoration was done by Prevardi. After a small procession from the Church till the square, the archpriest Rev Joe Cilia celebrated a mass on stage. Following the mass, a small procession was done with the statue of Saint Lawrence in Saint Philip Street, La Valette, Main Square, Nestru Laivera Street and back to the church. The entrance was accompanied by the popular antiphon of Rev Luigi Fene ch among the enthusiasm of the Vittoriosa people. The Saint Lawrence band accompanied the procession through the playing of hymns. 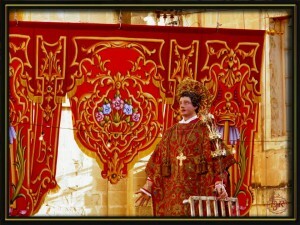 On Thursday 24th July 2014, Vittoriosa welcomed another popular relic of Saint Lawrence. This is the relic found in Amaseno which is said to contain the blood of Saint Lawrence. 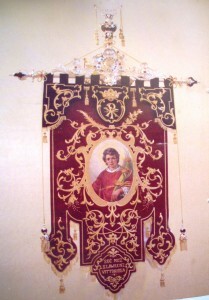 This relic was brought on the initiative of the Saint Lawrence Parish of Gozo. Archbishop Paul Cremona headed the procession which initiated from Saint Benedict Convent till The Parish Church, and a mass was celebrated. The Saint Lawrence Band Club accompanied the procession through the playing of hymns dedicated to Saint Lawrence.